Showroom Visits. Take a look at everything up-close and personal. This is vital for getting a sense of the material and the design. You will be able to see samples of the material and learn about different pricing options. This is important because not all stone is created equal and the process may differ considerably depending on what you want. 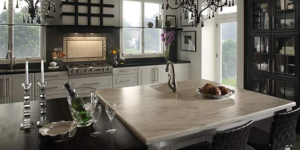 RJS Stonetops is a leading supplier of granite countertops in Vancouver with a stunning showroom displaying samples and past projects. This is one showroom that is sure to get you inspired! Decide on a Sink. Next, be sure to select what kind of sink you want installed. Very often, people select a stainless steel undermount sink. But if you need more help choosing the best sink for your space and your needs, check out our guide to choosing a kitchen sink. What’s Your Edge Profile? This is the design installed along the outer edge of your counter, and there are several options available to you. Be sure to ask about this during your planning and estimate stages. Obviously, edge types will differ in pricing. Grab a Backsplash. Material, colour, height…there are several things you will want to consider before settling on your final choice. The most common height is a 4-inch backsplash, usually tile, that extends between the countertop and upper cabinets. Faucet Layout. The installer must drill holes in the granite in order to accommodate for taps, nozzles, handles, and so on. Any special additions to the sink will have to be considered here, like a switch for the garbage disposal or other kinds of accessories. You will also want to think about how to space everything out. Stop By a Stone Supplier. That way, you can choose your slab personally and with someone there to answer your questions and concerns. You will be able to look over the supplied granite and determine what is worthy to decorate your home. It’s a very important process. You’ll want to have a price list for the stone with you so that you aren’t caught off-guard. If you only need a small piece of granite, a lot of these places have “unwanted” scraps that they will sell to you at a steep discount. It’s always a good place to start when you are trying to budget or save money, but you’ll have to be willing to take whatever you find. Installation. With everything finally in place, the fabricators will bring the slabs of granite into your home and begin to install them. It will probably take a couple of hours of work and then a 24-hour wait period before you can install the facet and connect all of the sink drains. Once this last step is complete, you can sit back and enjoy your new granite kitchen or bathroom countertop! Have any questions or comments? You can reach us on our Facebook page or check RJS Stonetops’ website for further information.